Zalando SE is a European e-commerce company based in Berlin. The company follows a platform approach, offering Fashion and Lifestyle products to customers in 17 European markets. Zalando was founded in Germany in 2008. Swedish company Kinnevik is the largest owner with 32%. Zalando was founded in 2008 by Rocket Internet, Robert Gentz and David Schneider, initially under the name Ifansho. Inspired by US online retailer Zappos.com, Zalando initially specialised in the sale of footwear. In 2009 Zalando began operating outside of Germany offering deliveries to Austria. In 2010 the company launched in the Netherlands and France and added apparel to its portfolio. In 2011 it opened online retail sites in the UK, Italy and Switzerland. In the following year Zalando expanded to Sweden, Denmark, Finland, Norway, Belgium, Spain and Poland. Since 2013, the usage of examples by tech companies from the East, especially China, Zalando changed into a European digital platform. Emulating Chinese companies, Zalando set off into remaking itself into a digital shopping mall, allowing fashion houses and retailers to make sales via the Partner Program as well, often with limited input from Zalando. In 2014 Zalando was listed on the Frankfurt Stock Exchange. Since 22nd June 2015, Zalando has been included in the MDAX. In 2015, Zalando started collaborating with Topshop and began selling merchandise online. Advertisements featuring the model Cara Delevingne were broadcast in Germany, Switzerland and France. In June 2015, the fashion trade fair "Bread & Butter" was acquired by Zalando, with the intention to open the globally important event to a broader audience as a "fashion festival". The first edition of "Bread&&Butter by Zalando" took place in 2016, hosting 20.000 visitors in the Arena Berlin. In 2018, Zalando launched Beauty in Germany, Poland and Austria and opened a beauty concept store in Berlin offering a regularly changing range of beauty products. Furthermore Zalando added beauty and care products for men to its portfolio and introduced its loyalty program "Zalando Plus" to customers in Germany. In June 2018, Zalando expanded its operations to Ireland and the Czech Republic. The markets are served over the existing logistic sites of Zalando. In November 2018, Zalando announced the discontinuation of "Bread&&Butter" due to a shift in strategy. In early 2019, Zalando opened a new logistics site in Brunna, Sweden as well as handing over its first own logistics site in Brieselang, Germany to Fiege Logistics. Zalando operates a customer-centric platform approach claiming to become "the starting point for Fashion" in Europe. It currently offers more than 300.000 products by almost 2.000 different brands in Fashion and Lifestyle. 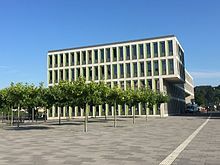 The core of Zalando's operations is conducted in Germany with centralized management located in their Berlin headquarters. The company employs over 6.000 people in Berlin and over 15.000 employees in total. More than 2.000 employees are dedicated to Tech in Zalando's Tech Hubs in Dortmund, Dublin, Helsinki and Lisbon, tech offices in Erfurt and Mönchengladbach and Zalando's Ad Tech Lab in Hamburg. Around 7.000 employees work in Zalando's eight logistics sites. The company also runs an off-price website called Zalando Lounge  as well as several outlet stores across Germany. Zalando follows customer-centered shipping, return and payment policies. They offer several payment options such as "payment after delivery" or "cash on delivery". Furthermore, customers can return items within 100 days after purchase. Zalando was accumulating losses ever since it was founded until it started making profit in 2014. The most important cost factors for Zalando are fulfilment costs and marketing costs, both taking up 50% of total revenues alone without the costs of sales included, with marketing costs as high as 25% in 2010. They managed to become profitable for the first time in 2014 which was due to cost management and profitable sales in their additional markets. Almost 50% of their sales revenues are generated in Germany, Austria and Switzerland which they define as one geographic unit under "DACH". Their yearbook furthermore shows that the firm was already profitable in this geographic unit as early as 2012. In April 2014 RTL broadcast the documentary Unrelenting pressure in the workplace (Arbeiten unter Dauerdruck), which had been made with the support of undercover journalist Günter Wallraff. The documentary led to renewed criticism on the labour conditions at Zalando. Journalist Caro Lobig worked undercover for three months as an order picker in the logistical center at Erfurt. During an eight-hour shift she had to walk up to 27 kilometres (17 mi). After five weeks she started to suffer from circulation problems. According to an anonymous employee working at the ambulance service, there is hardly a day when they are not called to the logistics center. According to a labour judge interviewed by RTL, Zalando violates German Labour law because of its rules on breaks, by prohibiting its employees from sitting down and by imposing airport-security-type measures on its employees. Through its tight control over its employees, Zalando would also be in violation of privacy rules. RTL requested Zalando to give comments to the allegations but Zalando refused. Instead, Zalando filed a complaint against Lobig for revealing corporate secrets. Lobig in turn filed a complaint against the company regarding her severance pay. In November 2015 the Centre for Protection against Unfair Competition in Germany filed a suit claiming that Zalando misled consumers on the availability of certain products suggesting that they needed to act fast to buy them. Zalando said that they had already changed their marketing practices, taking the Centre's concerns into account. They claimed that they no longer informed consumers that there were "three items available" when more than three were available. ^ "Consolidated Statement of Comprehensive Income". corporate.zalando.com. ^ "Consolidated Statement of Financial Position". corporate.zalando.com. ^ "Key Figures 2018". corporate.zalando.com. ^ "Shareholder Structure". Zalando Corporate Website. Retrieved 2017-11-26. ^ Saramowicz, Caroline. "Another Day, Another Cara Delevingne Campaign! Model Fronts Topshop's Zalando Campaign". graziadaily.co.uk. Retrieved 31 May 2015. ^ Jonas Rest (16 February 2014). "Online Modehandel Zalando: Zalando macht sich fit für die Börse". fr-online.de (in German). Retrieved 2015-02-14. ^ "ZALANDO ADVANCES ON GROWTH COURSE" (in German). 1 March 2018. Retrieved 2018-03-02. ^ "ANNUAL REPORT 2018 Key Figures 2018" (in German). 28 February 2018. Retrieved 1 March 2019. ^ Nach heftiger Kritik: Zalando-Partner reagiert Archived July 7, 2015, at the Wayback Machine, FashionUnited 02 August 2012. ^ "Startseite - Zalando Corporate Website". www.zalando.de. ^ Lukas Bay, Martin Dowideit (2014-04-15). "Zalando geht juristisch gegen RTL-Journalistin vor". handelsblatt.com (in German). Retrieved 2015-02-14. ^ Thomasson, Emma (5 November 2015). "German private-sector watchdog accuses Zalando of false advertising". Reuters. Retrieved 5 November 2015.